One of the things that most impresses me about independent designers is the level of quality and craftsmanship. I know this is not always the case. However, when I hear “indie” design, I get the impression that the product is fun and funky, but not sophisticated or long lasting. I think this is why I shy away from the term “indie” and say “independent” or “emerging” design instead. Yes, it’s semantics – but I think it makes a difference to how people see and buy design. 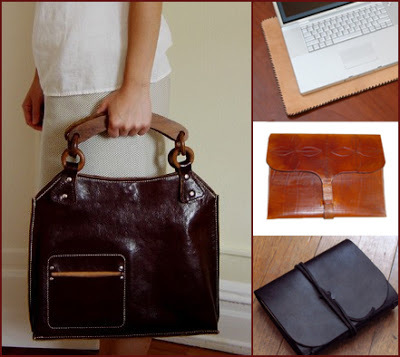 The leather work from these designers is stylish and timeless. I would like to think they would be equally at home in the collection of a Prada wearing executive as well as an artistic individualist.